With four littles under seven and a seven year old pup, quiet is not common. As I tucked each one in tonight, I hugged them a little tighter and paused a little longer. It’s a funny thing that fear. The slippery slope that tugs at a mama’s heart, trying to get in. If we dwell on fear, it takes hold of our heart. It takes our mind to places nightmares are made of. We think about the unthinkable. In a matter of seconds we can go from laughing with our children to being paralyzed, unable to breathe. Fear is a new struggle for me. Fear creeps in undetected and will suffocate the life within you, if you let it. In the past, fear is not something I remember dealing with. I wasn’t afraid to travel overseas as a mere high school student. I didn’t even have my driver’s license yet. Flying in an airplane wasn’t a big deal. Traveling to foreign countries, bartering in the market, in the face of uncertainty traveling through countrysides where had to get out of sight, crouching on the floor of the jeepnee because girls had been taken from vehicles to be raped and murdered. We aren’t promised tomorrow, but that just means I get to look upon the face of Jesus. Fear just hasn’t really been in my vocabulary. They are my heart outside of my body. The thought of losing one of them, I can’t even fathom it. I tuck them into their beds expecting they will bound into my room the next morning. Before I lay my head on my pillow, I kiss their little foreheads and check their breathing. I can’t help it. But it’s not just my kids. The thought of losing anyone I know to unexpected death, my chest tightens and it takes my breath. My heart races and I want to hop in our car and drive to their house to hug them. Which isn’t usually possible because we live so far away from family and most of our close friends. Maybe you’re in the same boat. Have you been blindsided by fear recently? It doesn’t have to be death. Fear comes in many different shapes and forms. Worry and anxiety usually go hand in hand with fear. Here’s the thing. We have a choice. The Bible makes it pretty clear what we should do when fear takes over. 2. Pray and Give Thanks. 3. Be strong and courageous knowing that God won’t leave you. 4. Take our thoughts captive. We can’t escape fear. It’s going to come. But we can be prepared. 5. Guard our hearts and our minds. When the thoughts creep in, we can not dwell on them. Instead, we have to shift our thoughts. Only then will we find freedom and truly live. 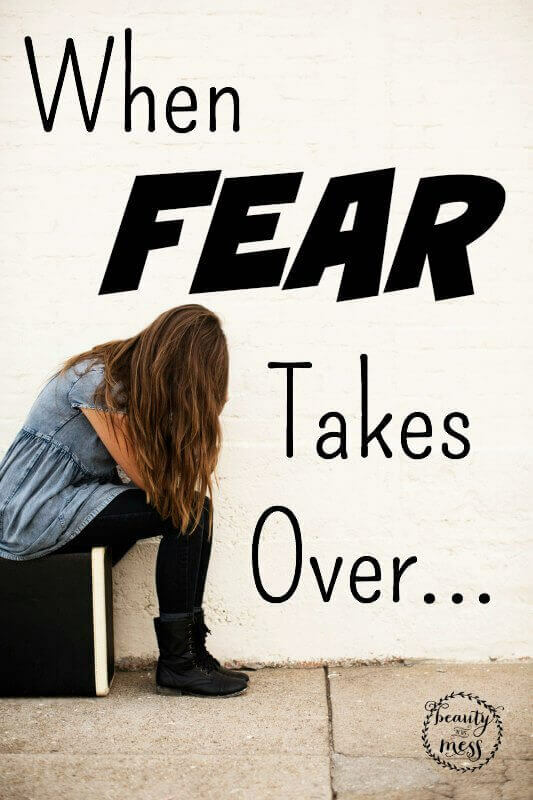 Are you dealing with fear today? How can I pray for you? Its amazing that having kids brings the struggle of fear with it. Trusting God with them, and others in our lives, is the key. Dwelling on Him and His Word is what has helped me. #4 is a big one for me too, I gotta take my thoughts captive! Great post! Visiting from Mama Moments Monday Link-up! Thank you for your comment! I’m so glad you found it helpful. The worry and fear seem so innocent but if I entertain those thoughts for even a small amount of time, they grow and overwhelm me. Hugs! I know this is old, but I happened to stumble upon it on Pinterest. God always knows what we need. Fear is nothing new to me. I’ve been struggling with anxiety for many, many years. Your article struck me differently though. The way you broke it down I guess. Thanks so much for sharing this. I KNOW God does not want us to fear anything, but lean on Him.